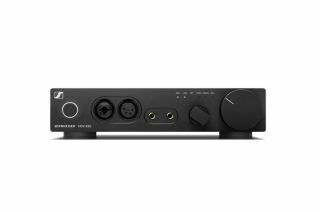 Sennheiser launches HDV 820 headphone amp and DAC | What Hi-Fi? The HDV 820 builds on the HDVD 800 - the firm's first digital headphone amp - with a new DAC making for improved sound. Sennheiser has announced a new headphone amp, the HDV 820. Building on the success of the HDVD 800 - the firm's first digital headphone amp - it offers a new DAC, higher-resolution sound and lower-distortion components. There's also improved fully balanced signal processing and low harmonic distortion. The new digital section is powered by an ESS Sabre32 digital-to-analogue converter (DAC). According to Sennheiser, this offers "unequalled dynamic range, ultra-low distortion and unmatched audio clarity". It performs at a PCM resolution of 32 bits and a sampling rate of up to 384kHz or 12.3MHz in DSD mode. The analogue section also builds on that of its predecessor. It features an unbalanced output through an XLR3/6.3mm combined NEUTRIK socket, one balanced XLR4 and two balanced 4.4mm Pentaconn sockets (the new standard for balanced headphone connections set by the Japan Electronics and Information Technology Industries Association - JEITA). Thanks to their unmodulated, low contact resistance, the Pentaconn sockets minimise distortion. Alongside the HDV 820, Sennheiser also announced the CH 800 P, a headphone cable that comes with the Pentaconn connector. It lets you connect the HDV 820 to high-end Sennheiser headphones such as the HD 800. Both the HDV 820 and CH 800 P will go on sale in July. The HDV 820 will cost £2089 while the CH 800 P price isn't confirmed yet.